Step into the wild and behind the scenes of this much loved television personality’s life. Discover what makes him tick and what his life is like as a wildlife TV presenter on popular natural history programmes. With dramatic video footage, stunning pictures and compelling stories Martin reveals the wildness that made him jump out of a hot air balloon to find out how fast a peregraine falcom flies and that nearly got his film crew killed for the perfect shot of a polar bear. 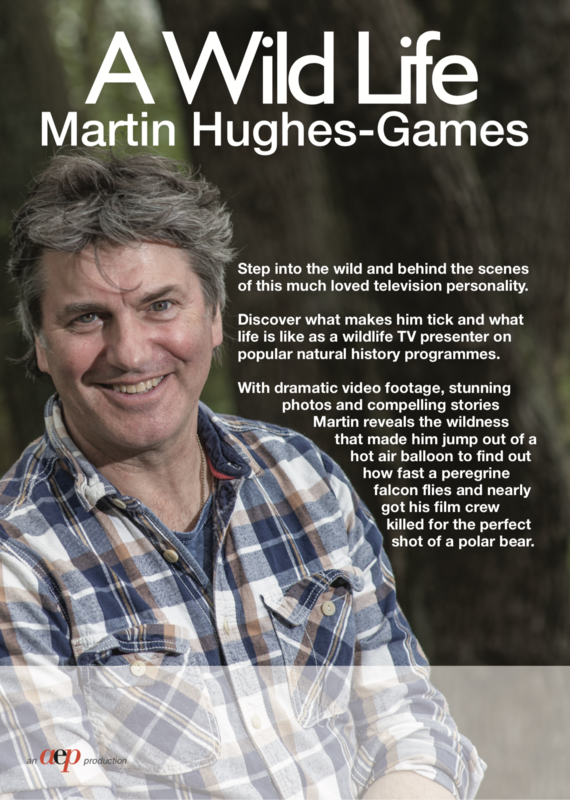 Martin Hughes-Games trained as a zoologist before joining the BBC science department as a researcher, then moving on to film production. He worked in television of 30 years presenting film and live television for BBC1 and BBC2. He is passionate about wildlife and is also an active conservationist. He was a member of the Springwatch production and presenting team from 2007 until 2018, firstly producing and then presenting. He also presented Hunting Tigers – 10 days in India (in production), The Lion Queens (Discovery), Springwatch Butterfly Special 2013 (BBC2), Springwatch Otter special (BBC2), Springwatch Guide to Seabirds 2012 (BBC2), Nature’s Miracle babies 2011 (BBC1), Autumnwatch 2009 “how do I?…”, and Springwatch 2009 Holidays with Martin Hughes–Games (BBC2). Martins interests stretch beyond wildlife. He is a qualified rope access technician (over 1200 hours logged working at heights) and a keen climber and he is a passionate motorcyclist (he raced successfully on UK tracks for 6 years). He has just published his first book, A Wild Life, which is an entertaining and informative account of his 30 years filming wildlife around the world, and is now busy writing his second book.